In situ high-temperature gas sensors: continuous monitoring of the combustion quality of different wood combustion systems and optimization of combustion process In situ high-temperature gas sensors Heinz Kohler et al. The sensing characteristics and long-term stability of different kinds of CO ∕ HC gas sensors (non-Nernstian mixed potential type) during in situ operation in flue gas from different types of low-power combustion systems (wood-log- and wood-chip-fuelled) were investigated. The sensors showed representative but individual sensing behaviour with respect to characteristically varying flue gas composition over the combustion process. The long-term sensor signal stability evaluated by repeated exposure to CO ∕ H2 ∕ N2 ∕ synthetic air mixtures showed no sensitivity loss after operation in the flue gas. Particularly for one of the sensors (Heraeus GmbH), this high signal stability was observed in a field test experiment even during continuous operation in the flue gas of the wood-chip firing system over 4 months. Furthermore, it was experimentally shown that the signals of these CO ∕ HC sensing elements yield important additional information about the wood combustion process. This was demonstrated by the adaptation of an advanced combustion airstream control algorithm on a wood-log-fed fireplace and by the development of a combustion quality monitoring system for wood-chip-fed central heaters. Kohler, H., Ojha, B., Illyaskutty, N., Hartmann, I., Thiel, C., Eisinger, K., and Dambacher, M.: In situ high-temperature gas sensors: continuous monitoring of the combustion quality of different wood combustion systems and optimization of combustion process, J. Sens. Sens. Syst., 7, 161-167, https://doi.org/10.5194/jsss-7-161-2018, 2018. Small-scale furnaces operated in domestic households, especially wood-log-fuelled heating systems and also wood-chip- or pellet-fuelled central heaters, are well known to contribute considerably to air pollution with toxic emissions of uncombusted and/or partly combusted exhaust gas components (CO ∕ HC) and particulate matter (PM) loaded with organics. Particularly in densely populated cities, villages and places where the exchange of environmental air is hindered by landscape profile (e.g. location in a valley) or by temporary inversion situations in wintertime, these emissions might accumulate and can create high risk for human health (Tapanainen et al., 2011; Meyer, 2012). There have been several attempts to reduce these toxic emissions, e.g. by improving the construction of the fireplaces and/or by introducing automatic combustion airstream control systems, based on continuous measurement of combustion temperature (Tc) and residual oxygen concentration (ROC) in the flue gas by sensors, which give leading input signals in control units of motor-driven combustion airstream regulators or fans. In contempt of these innovations, the emissions can hardly be controlled below the upper limits given by law (1. BImSchV) in Germany, and the overall pollution with CO ∕ HC and PM has been rising to alarming values in the last 5 years. From this point of view, it is obvious that the emissions of low-power wood combustion systems must be further reduced due to their significant contributions to environmental pollution. Our previous studies (Butschbach et al., 2009; Kohler et al., 2013a, b) have shown that firing process control can be further improved by optimization of the airstream control algorithms based on the additional introduction of an in situ gas sensor operated in the flue gas for continuous measurement of CO ∕ HC components like carbon monoxide (CO) or hydrocarbons like formaldehyde or methane (HC); this is called a CO ∕ HC sensor. This results in a tremendous reduction of toxic gas emissions from wood-log-fuelled single-room fireplaces by up to 80 % (Ojha et al., 2017) compared to the emissions of hand-operated (conventional) single-room furnaces. In addition, there is a high demand to monitor the combustion quality of automatically fed wood-chip-fuelled furnaces. The gaseous emissions of these furnaces are comparably low as long as the system is operated under optimized conditions. However, the continuous deposition of combustion residuals (ashes, soot, etc.) on the walls of the combustion chambers and heat exchanger tubes is known to have a negative influence on the combustion process during long-term operation and can correspondingly seriously reduce combustion quality (completeness of combustion) and efficiency (quotient of heat output to fuel heat input). This results in increased toxic gas and PM emissions. In this context, appropriate and reliable CO ∕ HC sensing will allow us to monitor the quality of combustion (QC) continuously and will enable routine cleaning and maintenance actions on demand. Service on demand will reduce costs and emissions and will increase the utilization ratio, provided that appropriate and long-term stable CO ∕ HC sensor elements are available. In this paper both aspects, improved process control of wood-log-fuelled firing and continuous monitoring of wood-chip-fuelled heaters with respect to their QC by introduction of CO ∕ HC sensors, are reported. In addition, the question of CO ∕ HC sensor stability is discussed by comparing the signals of different simultaneously operated CO ∕ HC sensors in lab firing experiments and in a field test over several months. Firing experiments have been conducted with a wood-log-fuelled furnace (SF10SK; Brunner GmbH, Eggenfelden, Germany) and two different wood-chip-fuelled central heaters (Multifuel Central Heater; A.P. Bioenergietechnik, Hirschau, Germany). One of the latter (heating power: 49 kW) was operated in the lab, and the other (heating power: 88 kW) was used to provide a small settlement of several houses with heat energy in field test experiments over nearly 4 months during the winter season 2016–2017. All furnaces were complemented by a sensor (LSU 4.9; Bosch) for measurement of ROC and different types of CO ∕ HC sensors, all positioned at the exhaust gas tube near the flue gas outlet of the firing system. The general concept of the construction of such furnaces with primary and secondary combustion zones and the position of the gas sensors is given as a schematic of a wood-log-fuelled fireplace in Fig. 1. Figure 1Schematic drawing of a wood-log-fuelled fireplace with indication of the primary and secondary combustion airstreams controlled by mass flow sensor–shutter systems (blue). The various sensor elements and their positions are depicted. For comparative evaluation of the CO ∕ HC sensors in the flue gas, a wood-log-fuelled fireplace (SF10SK) was additionally complemented with sensors for combustion air mass stream measurement (HFM7; Bosch) and motor-driven shutters in both combustion airstream channels. 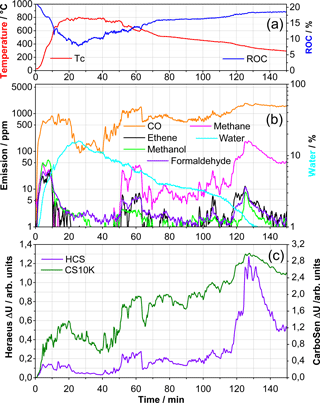 The combustion airstreams were adjusted to desired flow, which is estimated by a novel control algorithm based on Tc, ROC and CO ∕ HC emissions as described in detail in Butschbach et al. (2009) and Kohler et al. (2013a). The calculated combustion air mass streams are adjusted by controlling the shutter position with a separate nested control algorithm in time intervals of 20 s based on air mass stream measurement. This enables the application of combustion airstream control systems to fireplaces with natural chimney draught as well, for which different draught conditions have to be expected depending, for instance, on the temperature of the chimney and on the outside air draught conditions estimated by the local weather situation. Before the sensor evaluation experiments could be started, the parameters of the algorithms for airstream control had to be valuated first in iterative firing sequences to gain proper reproducible automated operation of the SF10SK fireplace. For the evaluation of the sensors in the exhaust gas of the wood-chip-fuelled firing system, the standard operation and control unit of the producer were used. In addition, a monitoring system with software was developed, which enabled continuous calculation of the QC under practical conditions of operation (field test experiments). The software algorithm recorded and assessed the data from the furnace control unit, the actual heat output measured with a heat meter (Sharky 773; Diehl Metering GmbH) and the sensor signals for Tc, ROC and CO ∕ HC content in the exhaust gas and the combustion air mass streams. The software code for actual QC estimation was developed on the software platform SOPAS ET (Sick AG, Reute), taking the mathematic correlations for the biomass combustion process into account (Sect. 3.3). The main focus of this work was to investigate the sensitivity and signal stability of different kinds of CO ∕ HC gas sensors which were selected as interesting candidates for in situ operation in the flue gas of low-power wood combustion systems. The availability of such long-term stable sensors at ambient temperatures in the range up to 500 ∘C is the prerequisite for establishing the above-mentioned new firing process control algorithms and a system for continuous QC monitoring. Commercially available high-temperature (HT) gas sensors of the non-Nernstian mixed potential (MP) type have been investigated: CarboSen (CS) 1K and 10K (Lamtec GmbH & Co. KG, Walldorf) and a prototype sensor for CO ∕ HC plus ROC measurement (HCS; Heraeus GmbH). The CO ∕ HC sensing concept of both kinds of gas sensors is based on Au,Pt/YSZ/Pt electrochemical cells. The signal of these MP-type sensors cannot represent individual gas components but represents a value of the CO ∕ HC content in the flue gas, whereby the relative sensitivity to individual gas components depends on the composition of the electrode material and operation temperature. 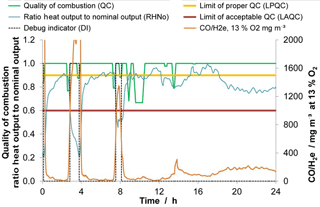 An overview of the different sensor concepts for CO ∕ HC monitoring in wood combustion exhaust gases, including different metal oxide gas sensors and MP-type sensors, was already reported in Ojha et al. (2017). The basic measuring principle, set-up and specific properties of CS MP-type sensors are reported in Zhang et al. (2017) and details of the operation and signal generation of the HCS are described in Wienand et al. (2014). The sensors are designed for in situ flue gas operation and are protected from particulate matter contamination by filters. Generally, they are in contact with a multitude of gas components (majorly CO, CH4, Formaldehyde, alcohols, organic acids, etc. ; Marutzky and Seeger, 1999) which vary in concentration depending on the instant-of-firing situation (ignition phase, HT phase, which is steady state in the case of automated fuel feeding, burnout phase) and on the kind of wood used as fuel. 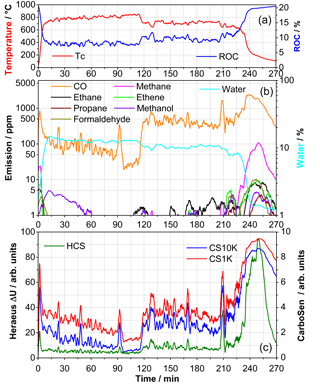 The CO ∕ HC sensor performance was studied by in situ operation in the flue gas and simultaneously the flue gas composition was analysed by extraction of a partial gas stream using a high-temperature FTIR gas analysis system (GASMET; Ansyco GmbH, Karlsruhe). This kind of referencing of gas composition allows for an analysis of all IR active components in time intervals of 10 s and may give valuable information about the individual dependence of the CO ∕ HC sensor signal on the different flue gas components. However, the quantification of sensitivity and signal drifts during in situ operation in the flue gas is not easily possible by referencing the gaseous emissions because these are not well reproducible and vary considerably over time, as numerous different components are emitted at a time (Marutzky and Seeger, 1999) and the MP signals of all CO ∕ HC sensors under investigation depend on the concentrations of many different components of the flue gas with different sensitivities (Ojha et al., 2017). For this reason, i.e. 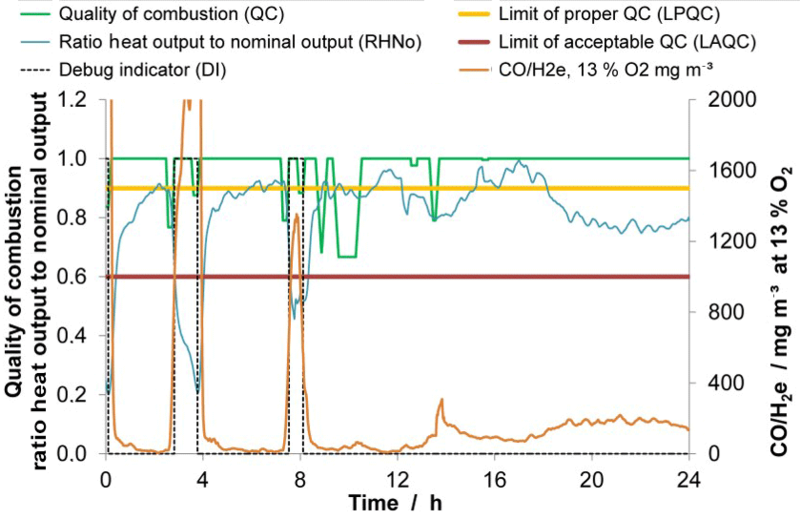 to get an independent valuation of the sensitivity and drift behaviour, the sensor elements were repeatedly calibrated in CO ∕ H2(1 : 1) ∕ O2 ∕ N2 model gas mixtures after certain times of operation in the exhaust gas according to the procedure described in Ojha et al. (2017). This allows for the measurement of CO ∕ H2-equivalent concentrations (CO ∕ H2e) in the flue gas and enables the investigation of the development of the signal stabilities during in situ operation in flue gases through the use of a standard gas mixing system (Jerger et al., 2002). Compared to COe values, which are well introduced for MP-type sensors, the CO ∕ H2e values were clearly found to describe the real flue gas CO ∕ HC composition better. The CO ∕ HC sensors under evaluation were operated in the flue gas of two wood-chip-fuelled central heaters of the same type (Sect. 2.1) for different experimental purposes. Combustion experiments were carried out in the lab over about 6 h a day. Between the firings the system was carefully cleaned to obtain reproducible combustion conditions. The signals of CS1K, CS10K and HCS over time of a typical test sequence are given in Fig. 2 together with the Tc, the ROC and the analysis of IR active flue gas components by quasi-continuous HT-FTIR analysis. After ignition, the system was operated at 70 % nominal power (NP) up to 120 min, then reduced to 50 % and the firing process was stopped at 225 min. According to the given standard operation and control unit of the producer, operation at different heating power is set by different wood-chip feeding currents and correlated with different Tc and different concentrations of toxic gas emissions, especially CO. Even a small Tc increase at Tc > 800 ∘C is reflected in a significant reduction of the ROC and CO concentration (c(CO)). Correspondingly, when Tc fell to about 700 ∘C (after reduction of the NP to 50 %), c(CO) increased from less than 50 ppm to about 500 ppm. Figure 2Typical sequence of (a) combustion temperature (Tc) and residual oxygen concentration (ROC), (b) the continuous flue gas analysis (FTIR) and (c) the CO ∕ HC sensor signals measured on the wood-chip-fuelled heater over time. The experiment started with cold ignition to steady-state operation at 70 % nominal power (NP), a subsequent change to 50 % NP at 120 min and after about 225 min the heater is operated down and stopped. Except for an offset, the progression of the signals of CS1K and CS10K is rather similar (Fig. 2). They mainly follow the CO signal of the HT-FTIR system, but the values are clearly enhanced beyond 225 min when the concentration of the hydrocarbons contribute significantly to the MP. In contrast, the signals of the HCS are very low as long as the concentrations of the hydrocarbons are less than 5 ppm. Even to the stepwise rise in c(CO) after the change from 70 to 50 % NP, the sensor reacts only with a small but significant signal increase. This indicates that the signal of this type of MP gas sensor depends less on c(CO) and seems to be more estimated by the concentration of methane (c(CH4)) and perhaps other hydrocarbons, which is reflected in a steep signal increase when those components rise after the combustion was stopped. In this context the CarboSen sensors seem to be more sensitive. Even c(CO) values lower than about 50 ppm are clearly recorded. Significantly higher emissions are observed when the heater is continuously operated in a mode for heating of a settlement (field test) over months and NP is repeatedly changed in small time intervals according to the heat demand and without any routine maintenance. Now emission peaks even higher than 1000 ppm CO (Fig. 3) are observed. The CO ∕ H2e concentrations calculated for both types of sensors (from calibration data) follow quite well the course of c(CO) referenced by a standard portable CO analysis instrument (A600; Wöhler GmbH), but again, the signal response of the HCS is significantly lower. This confirms the inference above that this type of sensor is less sensitive to CO. 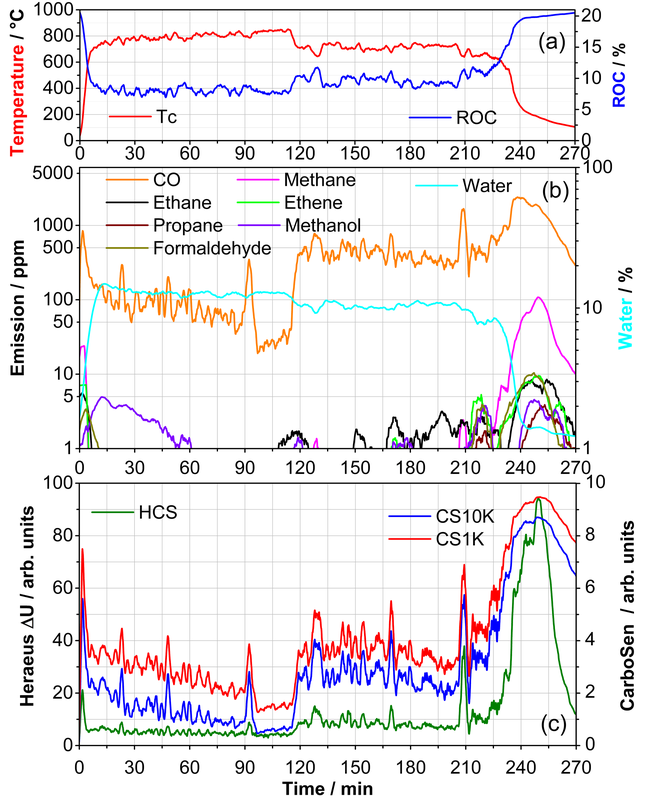 Figure 3Representative cut-out of the CO ∕ H2e concentrations of a CS10K and an HCS, as calculated from the calibration data, registered together with the CO concentrations after a 4-month operation sequence of the multi-fuel wood-chip-fired central heater under field test conditions. The sensor signals of another set of CO ∕ HC sensors operated during a representative batch experiment on the wood-log-fuelled fireplace are visualized in Fig. 4 together with the flue gas FTIR analysis, Tc and ROC. The automated combustion airstream control was conducted according to a novel control algorithm as introduced in Sect. 2.1. The experiment is based on independent combustion air mass stream control algorithms for primary and secondary combustion airstreams with separate control parameter valuation for the ignition phase (IP, 0–10 min), high-temperature combustion phase (HTCP, 10–50 min) and burnout phase (BOP, 50–150 min) as reported by Butschbach et al. (2009). During the HTCP the concentrations of emitted uncombusted components are very low (Fig. 4). 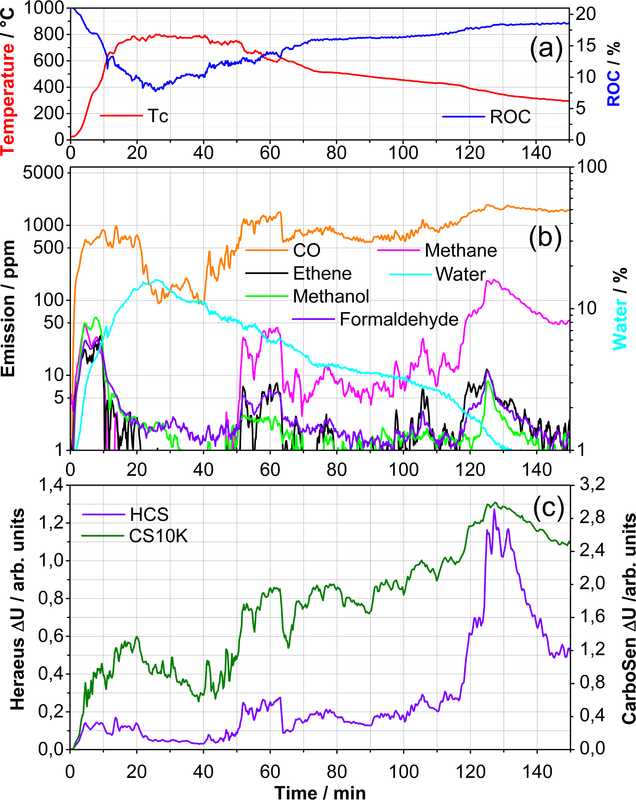 However, there is no strong correlation of Tc, ROC and CO ∕ HC emissions. For example, at the end of the IP the concentration of hydrocarbons (HCs) sharply decreases, Tc rises still beyond 700 ∘C and ROC continuously falls (Fig. 4), but c(CO) is more or less constant. Only beyond 20 min does c(CO) steeply fall to very low concentrations (Fig. 4). But even in the HTCP at temperatures between 750 and 800 ∘C there is no obvious correlation between CO ∕ HC content and ROC. This example clearly demonstrates that the continuous independent measurement of Tc, ROC and CO ∕ HC content is indispensable to enable optimized combustion by optimum airstream control of wood-log-fuelled low-power fireplaces. Figure 4Course of (a) the combustion temperature (Tc) and the residual oxygen concentration (ROC), (b) the FTIR flue gas analysis and (c) the CO ∕ HC sensor signals of CS10K and HCS in a typical wood-log combustion batch firing experiment. Regarding the course of the two signals of a CS10K and an HCS (Fig. 4), the response to different flue gas compositions is clearly different due to different sensitivities. In good agreement with the observations described above (Fig. 3), the HCS signal is generally lower and seems to depend mainly on c(CH4) and perhaps to some HC components. The CS10K signal, however, may be more sensitive to c(CO) and on some organic gas components as well. The individual correlations of the signals with the flue gas components are still under investigation. 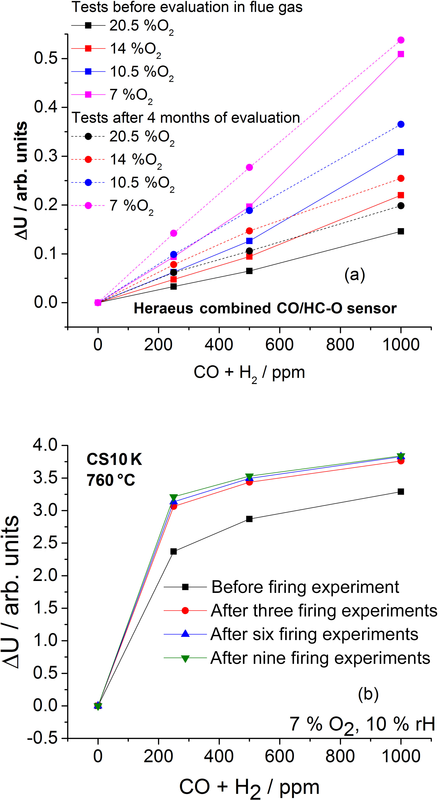 The sensor signal stability was evaluated by repeated sensor signal measurements under exposure to CO ∕ H2(1 : 1) ∕ O2 ∕ N2 model gases according to the procedure described in Sect. 2.2. An overview of the results is given in Fig. 5. Surprisingly, both types of sensors show increased sensitivity after in situ operation in the flue gas. After a 4-month field test period the sensor signals of the HCS were increased significantly at all oxygen concentrations (Fig. 5a). The sensitivity of the CS10K sensor element was clearly increased after the first three firing experiments and then seems to stabilize with further operation in the flue gas (Fig. 5b). In this context, it is important to report that in most cases the opposite trend (sensitivity loss) has been observed in the past and sometimes a sensitivity increase up to hours of operation in flue gas and a subsequent steep decrease in the sensitivity after further operation has been measured (Ojha et al., 2017). The reasons for these individual behaviours are not yet well understood. It is assumed that different changes over time in the kinetics of the anodic reactions with the target gas components (CO, HC) compared to the cathodic reaction with the oxygen during operation in the flue gas seem to play an essential role related to drift behaviour. This is because MP is generated under conditions of balanced anodic and cathodic current conditions (Miura et al., 2014; Zhang et al., 2017). These aspects of signal change upon exposure to CO under different oxygen concentrations are systematically investigated by combined structural and electrochemical studies (Zhang et al., 2018). Figure 5Evaluation of long-term stability by repeated sensor signal measurements. (a) Sensor signals of HCS sensor before and after 4 months of operation in the flue gas of a wood-chip central heater (field test) at different c(O2), and (b) CS10K signals in model gases with 7 % O2 concentration before and after three, six and nine batch wood-log-fuelled firing experiments. In addition to the necessity of an optimal control of the combustion process, the continuous monitoring of the QC is the second essential reason for the introduction of sensor-based CO ∕ HC measurements in the flue gas. Analysis of the emitted CO ∕ HC components relates directly to the quality of the combustion process. With the sampling of a dataset of the wood-chip-fuelled central heater during real-life operation as described in Sect. 3.1.1, a detailed in-depth estimation of the actual QC and combustion efficiency could be demonstrated. Both values are important for continuous monitoring of the actual QC. For this purpose an algorithm was developed based on the actual efficiency of combustion (quotient of heat output to fuel heat input), RHNo and the CO ∕ H2e emissions. RHNo is defined as the quotient of actual heat output measured by the heat meter divided by NP given by the manufacturer, thus representing the actual load status of the furnace. The CO ∕ H2e emissions were calculated from the HCS sensor signal. An overview of the data is given in Fig. 6. The bold horizontal yellow line represents the lower limit of proper QC (LPQC), which is set to 0.9. At QC values lower than LPQC, proper operation is not supported and the system will give a service signal. The bold horizontal red line is defined as the limit of acceptable QC (LAQC), which is set to 0.6. At QC values lower than LAQC, the system will give a failure signal. The green curve (Fig. 6) represents the calculated QC, and in addition the course of the CO ∕ H2e values referenced to ROC = 13% (brown curve) is plotted. If a malfunction, a failure or a shutdown of the furnace is recorded by the monitor system, the debug indicator (DI) is set to 1. Because DI = 1 gives the status referred to as a malfunction of the furnace with no combustion process or very poor combustion quality, the determination of QC is not possible or relevant. In this case (DI = 1) the QC value is set to 1 because DI has a higher priority than QC; thus, DI is the only determinant parameter for failure analysis. If the value of DI is equal to 1, service or maintenance is necessary except in situations when the furnace is switched off. If DI = 1 the monitor system will give a failure signal so that the operator can perform the required maintenance. Moreover, because all parameters for the calculation of QC are recorded and related to a predefined value range of proper operation, the algorithm allows us to monitor the reason for malfunction and enables us to ascertain the service demand. Figure 6Example of the calculated quality of combustion (QC) in a wood-chip combustion unit with 88 kW of nominal heat output in field operation over a whole day in the winter season. In Fig. 6 three segments with DI = 1 are recorded. All segments represent a shutdown or disabled combustion because the heat buffer tank was sufficiently loaded; this means there was no heat demand at these time segments. Between the segments with DI = 1 the wood-chip furnace was operated with a high heat output. Thus the RHNo was greater than 0.8 and, together with low CO ∕ H2e values, this leads to a high combustion quality with QC > 0.9. In these segments the calculated CO ∕ H2e signal from sensor HCS was most of the time lower than 200 mg m−3 (13 % ROC). The CO ∕ H2e limit above which the calculated QC is significantly decreased below 0.9 was set to 400 mg m−3 (13 % ROC). This is the emission limit according to 1. BImSchV. All CO ∕ HC gas sensor elements under investigation are of the non-Nernstian mixed potential (MP) type and therefore cannot represent individual gas components. In a flue gas environment the sensor signal is generated by all reactive gas components but at individual sensitivities depending on the MP electrode material. Therefore, the sensor signals represent the flue gas composition and concentration in an individual manner. In this context, all sensor elements under study are generally suitable for monitoring the quality of combustion (QC) and for the development of advanced software for control of the combustion airstreams to improve the QC and reduce the toxic gas emissions, especially for wood-log-fuelled firing systems. The signals of CS1K and CS10K sensor elements are well correlated with variations in CO emissions; however, the HCS sensor is more related to the variation in CH4. Further comparative studies will give more insight into the long-term stability of the different types of sensors and their individual behaviours when operated in the flue gas. As a highlight, one of the sensor elements (HCS) showed no signal loss even after a 4-month field test operation in the flue gas of a wood-chip combustion heater. The use of the HCS CO ∕ HC gas sensor signal and numerical matching with system parameters of the wood-chip-fuelled central heater in a 4-month field test allowed us to develop a QC monitoring system. Moreover, the system enables the output of status process parameter values as well as service and failure signals. The developed system is already a useful tool for remote maintenance and may also act as an active QC protocol unit. A dataset supplementing Figs. 2, 3, 4, 5 and 6 is provided at https://doi.org/10.5281/zenodo.1189998 (Kohler et al., 2018). This project was funded by the Bundesministerium für Ernährung und Landwirtschaft (BMEL) and executed by the Fachagentur für Nachwachsende Rohstoffe (FNR), Gülzow. Butschbach, P., Hammer, F., Kohler, H., Potreck, A., and Trautmann, T.: Extensive reduction of toxic gas emissions of firewood-fueled low power fireplaces by improved in situ gas sensorics and catalytic treatment of the exhaust gas, Sensor. Actuat. B-Chem., 137, 32–41, 2009. Jerger, A., Kohler, H., Becker, F., Keller, H. B., and Seifert, R.: New applications of tin oxide gas sensors – II. Intelligent sensor system for reliable monitoring of ammonia leakages, Sensor. Actuat. B-Chem., 81, 300–307, 2002. Kohler, H., Brunner, S., Butschbach, P., and Glesing, D.: Sensorik und Abgas-Katalyse zur Reduktion der Emissionen von Klein-Holzfeuerungsanlagen, Konferenz “Energetische Biomassenutzung – Neue Technologien und Konzepte für die Bioenergie der Zukunft”, Berlin, 5. Nov. 2012, Konferenzband Energetische Biomassenutzung, S. 80, 2013a. Kohler, H., Potreck, A., and Trautmann, T.: Verfahren und Vorrichtung zur Verbrennung von Brennstoffen, EP 2 066 972 B1, 2013b. Kohler, H., Ojha, B., Illyaskutty, N., Hartmann, I., Thiel, C., Eisinger, K., and Dambacher, M.: Dataset supplementing Kohler et al., 2018, Zenodo, https://doi.org/10.5281/zenodo.1189998, 2018. Marutzky, R. and Seeger, K.: Energie aus Holz und anderer Biomasse, DRW-Verlag, Leinfelden -Echterdingen, 1999. Meyer, N. K.: Particulate, black carbon and organic emissions from small-scale residential wood combustion appliances in Switzerland, Biomass Bioenerg., 36, 31–42, 2012. Miura, N., Sato, T., Anggraini, S., Ikeda, H., and Zhuiykov, S.: A review of mixed-potential type zirconia-based gas sensors, Ionics, 20, 901–925, 2014. Ojha, B., Illyaskutty, N., Knoblauch, J., Balachandran, M. R., and Kohler, H.: High-temperature CO ∕ HC gas sensors to optimize firewood combustion in low-power fireplaces, J. Sens. Sens. Syst., 6, 237–246, https://doi.org/10.5194/jsss-6-237-2017, 2017. Tapanainen, M., Jalava, P. I., Mäki-Paakkanen, J., Hakulinen, P., Happo, M. S., Lamberg, H., Ruusunen, J., Tissari, J., Nuutinen, K., Yli-Pirilä, P., Hillamo, R., Salonen, R. O., Jokiniemi, J., and Hirvonen, M.-R.: In vitro immunotoxic and genotoxic activities of particles emitted from two different small-scale wood combustion appliances, Atmos. Environ., 45, 7546–7554, 2011. Wienand, K., Zinkevich, M., and Ullrich, K.-H.: Gassensor zur Messung unterschiedlicher Gase und zugehöriges Herstellungsverfahren, WO2014, 198540, A1, 2014. Zhang, X., Kohler, H., Schwotzer, M., and Guth, U.: Mixed-Potential Gas Sensor with Layered Au,Pt-YSZ Electrode: Investigating the sensing mechanism with steady state and dynamic electrochemical methods, Sensor. Actuat. B-Chem., 252, 554–560, 2017. Zhang, X., Kohler, H., Schwotzer, M., Wu, Y. H., and Guth, U.: Combined electrochemical and structural studies of a layered Au,Pt-YSZ mixed potential gas sensing electrode: Sensing response, dynamic electrochemical behavior and structure properties, ACS Appl. Mater. Inter., ready for publication, 2018. Wood-log- and wood-chip-fuelled low-power combustion systems emit high amounts of uncombusted gaseous components like CO and particulate matter. Emissions can be effectively reduced by optimized combustion process control using high-temperature gas sensors. The sensing behaviour of gas sensors for continuous analysis of uncombusted components and their long-term stability have been studied. The sensor signals are used to improve the combustion process control and to monitor combustion quality.